Opening Night is here with Depth, Attitude and Coaching · Let's Go Amerks! It’s finally arrived. After yet another LONG summer we’re now on the cusp of opening night and while several previous seasons have yielded some good free agent signings – this summer was outstanding. There’s three reasons to be more excited about this season than previous ones: depth, attitude and coaching! 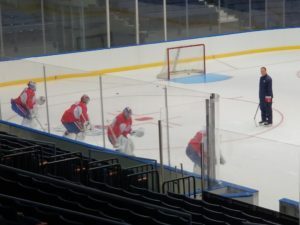 A quick look at the Sabres roster shows that potential Amerks Seth Griffith and Matt Tennyson have made the Sabres roster and opening night lineup (and playing well, too). There’s also the potential for Justin Falk and Evan Rodrigues who are injured up in Buffalo to eventually find their way down. Two to three of those players were expected here opening night and if it were previous seasons not having them would cause Amerks nation instant anxiety but not so this year. Conor Allen, Barry Goers, Sahir Gill, Garret Ross and Adam Krause are very good AHL players here to provide depth and have already been here for 2 weeks learning the system and familiarizing themselves with the organization. We also wouldn’t have seen proven leaders and winners like Andrew MacWilliam or Nathan Paetsch signed after so many other players were signed in July. Depth! Finally, if (hockey) God forbid any key player is lost for the season – he needs to be replaced with quality ASAP. Any need/issue we show needs to be fixed immediately. Waiting until February doesn’t get the job done as we’ve learned the hard way. A new affiliation with the ECHL Cincinnati Cyclones has ensured that players will be ready to immediately make the jump up to fill in as needed without having to hunt for players to sign to PTO’s. Another big difference is attitude. The mandate is clear from Botterill, Sexton and Taylor – you’re here for a reason and that’s to win (while developing and helping everyone around you). The days of being “demoted” or “sent down” to the Amerks are gone. You’re sent to the Amerks to get playing time you aren’t going to get in the NHL which leads to better development. Success in the AHL will lead to career success. The list of past players who’ve pouted and simply gone through the motions is endless. They knew they were next on the call up list. That call up list still exists and always will but the difference is a focus on winning here. Additionally, there are fewer rookie players expected to immediately produce on this roster. Yes, the AHL is a “developmental” league but you can be too young and we have been too frequently in past years. A roster stacked with young draft picks expected to get better without any help around them is not a winning recipe. The right veteran core will make all the difference with the prospects who are here. We’ve had a few vets here the past several seasons who fooled themselves into thinking they were NHL players based on getting playing time because of extreme injuries with a very bad Sabres team. I feel like we have some veterans who know their roles this season. Speaking about roles, those veterans know what they’re here for but also know that the coaching staff plans to make them better along with that high level draft pick. Chris Taylor seems so passionate that it’s hard to recognize him from when he was assistant coach Chris Taylor. I was initially underwhelmed by the hiring but his focus and passion have made me do a 180. I love that someone who loves Rochester is now leading the team that has the greatest capacity of bringing pride and joy to this city. He has talked repeatedly about his job to make everyone better and get them to where they want to go. Everyone understands prospects but the veterans can’t be forgotten either as mentioned above. He’s also talked about hating opposing teams and he’s not hiding that either. Hate the other team and make it so that they don’t want to play against you. Assisting him on the bench is Gord Dineen who is hockey royalty – what a hire there! And rounding out this staff is Toby Petersen – who is a proven Calder Cup winner. “We’re not going to take any crap from anyone coming into our building,” Tails talking about the season ahead. One proud #Amerks head coach! Now on to the roster.. While not full of rookies or even what I would categorize as being too youthful… Kevin Porter is the lone veteran among this group. 2nd and 3rd year players will need to play well. Also, one could argue without Griffith that we lack a true natural scorer. But as long as Bailey and Baptiste have the right attitude and continue to improve… and Stevie Moses and Kyle Criscuolo produce as they should… I’m confident we’ll have enough scoring by committee to not worry – especially with the D expected to be a big part of the offense under Housley’s new system. I expect Hudson Fasching to be a power forward at this level now that he’s healthy. My gut says he will be with Buffalo before too long. Alex Nylander will hopefully be able to continue to mature without too much pressure and Eric Cornel and Vaclav Karabacek will hopefully show everyone that they are still top prospects as well. I need to watch more of the two true rookies on the roster – C.J. Smith and Sean Malone – but both come with high expectations and I liked Smith’s game in the preseason. Garret Ross will look to resurrect his career and DMB hopefully will earn himself an NHL contract and most popular player award. I wouldn’t be shocked to see Erod down here once he’s healthy. His smarts and non-vet status would be huge for us. This is our strength and perhaps the strongest core in the entire league. It’s an experience group – even without Justin Falk who I also expect to see down when he’s healthy (barring a waiver claim). At an average age of 28 – we shouldn’t expect too many errors from inexperience! Rochesterian and 2-time Calder Cup winner Nathan Paetsch will lead this talented group along with Andrew MacWilliam who we’ve seen play a great D against us for years with the Marlies. Taylor Fedun will QB what HAS to be an explosive power play and newcomer Zach Redmond brings along a ton of NHL experience and should be the QB of the the other power play unit. Casey Nelson – our best defenseman the last six weeks of the 2016/2017 season – hopes to continue his progress and the best prospect we’ve had here since forever – Brendan Guhle should be very fun to watch while he’s here. Guhle is an example of the attitude mentioned above. He’s one of the first players on the ice every practice putting in the time he needs to learn from guys like Dineen and Paetsch. He isn’t concerned about being “sent down,” he’s embracing the opportunity to get a lot of minutes. It’s time for Linus Ullmark to shine in his 3rd and final season here in Rochester. I expect a season from him similar to what Jacob Markstrom had for Utica a couple of years back – especially with this defense in front of him. He may thrive facing a lot of shots… but last year was too many shots that were too good far too often. Experienced AHL’er Adam Wilcox won the backup job and will be able to backup Ullmark reliably when needed. Looking beyond Ullmark and Wilcox there’s Jonas Johansson and Jason Kasdorf in Cincinnati. Looking at the worst case scenario if Lehner gets injured we’d see Ullmark get called up to the Sabres and Johansson to the Amerks and still remain confident in net. There is a lot of solid depth in Cincy when the inevitable recalls and injuries occur (but hopefully at a slower pace than recent seasons!). *Vet Status: As a reminder – you can only dress 5 players with 320+ (coming into the season) AHL or higher regular season games and one exempt at 260-319. We currently have 4 vets and 2 exempts so we’re good for now; they are: (4)Porter/Paetsch/Fedun/Redmond … (2)MacWilliam/Allen. Falk would likely push Allen out of the lineup if he were clear waivers and come down. The constant communication between Jason Botterill, Randy Sexton, Phil Housley, Chris Taylor and all of the players and staff is what’s going to make this entire organization successful again and everyone has bought in to the system (unlike previous micro management which there’s no need to really discuss anymore). I want to end this by declaring that anything other than 5-6 playoff wins would be very disappointing. That’s a reasonable number for any good hockey club to need to meet to say the season was a success. Yeah – Frank (Calder Cup was named after Frank Calder) is the goal – but “she’s not an easy one to win”, as Dan Frawley once said. We’ve written a lot more on Twitter the last two weeks than in article format so if you aren’t following us there you’re missing out. Head over to twitter.com/LetsGoAmerks and follow along!